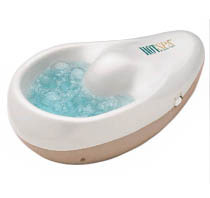 Helen of Troy HotSpa Heated Nail Bubble Spa is the first ergonomically designed nail spa to service manicure clients. Your clients will enjoy the stimulating heated micro-bubble water massage, which offers a soothing and relaxing pre-manicure soak. Also great for at home use...relax in the comfort of your home and give your hands some much-needed attention with this heated bubble spa.